MA: How do you reflect on what has been a remarkable year for you? VL: I have personally had a very good year but France hasn’t. Those truly awful events impacted on how everyone feels. However, Cannes, for now, is the greatest memory of my career. It’s the most wonderful prize on the planet, even better than an Oscar. Like winning gold at the Olympic Games. When I was named, by an unbelievable jury which included the Coen brothers, I nearly passed out. Why me? I never imagined in my life that I would win this prize – even in my dreams. Winning at Cannes? There’s zero chance. First of all you have to be in a film that is selected for Cannes, the film has to be incredible, and all of the world’s actors have to be in films which aren’t as good as yours. And the fact that the prize was won by a Frenchman at the Cannes film festival; I never dared to think of it. And for a film which we made with very little money over just two weeks. It’s the smallest French film on the biggest screen in the world. 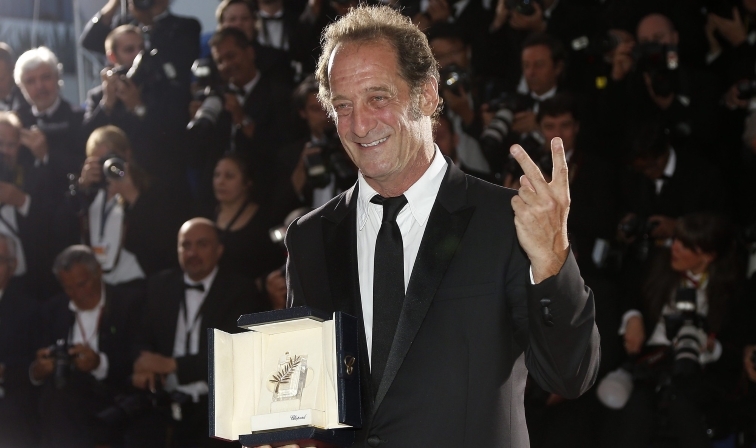 MA: These awards – Cannes above all – mark the pinnacle of a long career. What inspired you to become an actor in the beginning? VL: I really don’t remember. It wasn’t by the typical means like others who have a vocation for this work. It was the summer of 1981, I’d finished my studies, travelled around American for 6 months and found myself back in Paris. My dad says to me: “Do something, whatever you do, don’t just do nothing.” I went to work for a newspaper as a journalist; I had very flexible hours and after 4pm didn’t have anything to do. So I enrolled in acting classes for a bit of a laugh. During the 1980s it was a little exclusive, just pretty bourgeois girls – I think I joined up more to meet them than for actually doing any theatre. To my surprise, I was taken on – I learned the scripts and did the plays. It was like a sort of therapy, good for my own character and well-being. Other actors and directors came along to auditions and one picked me out. I was in his film for something like 3 minutes, a very small part. Then I had four, five, six minutes and today I’m sitting in front of you. I never had the time to stop and think what it was I was doing, I was off on and running and didn’t look back. MA: The Measure of a Man is the third film you’ve made with Stéphane Brizé – what is it you like so much about working with him? VL: I love his cinematic universe, the social caste Stéphane is interested in. He’s a guy that writes about people who touch us, that speak directly to and of us; a little like the Dardennes brothers. His films are a witness to our lives right now, a photograph of the moment in time when the film was made. Like an aerial photograph of the state of the world at that precise moment. The first film we made was called Madame Chambon where a builder fall in love with his son’s teacher. It was a big success but is a very simple film. He then wrote A Few Hours of Spring where I spend time with my dying mother which was successful as well. So when it came to The Measure of a Man, I couldn’t resist. The funny thing is he and I are very different – we don’t have the same attitudes, tastes, friends or way of life but as soon as we arrive on set there is a kind of fusion and we become the same. We are the double of one another; I am the actor he would have been and he the director if I would have been. MA: Measure is a very realist film, certain elements resembling documentary – most notably the long takes: does this technique pose a significant challenge as an actor? VL: For long takes you really have to be very concentrated all the time. You can’t let your guard down. But I love that, even if it is a real challenge. Everyone is in the same boat. Everyone is in danger. I find that extremely interesting. When there are lots of cuts it takes away those moments of silence. The moments where people take their time as they do in real life. Realism also comes from a rhythm – that means that we take our time, you ask a question and don’t respond immediately. Whereas when editing a film, the director can decide how long there is between responses. It’s good for a film like Measure whose heart revolves around the real, which is close to documentary filmmaking but isn’t a documentary. We lose the sensation that I am the one doing the film, that I am an actor. At Cannes – and this is the most wonderful compliment anyone has ever made me – the Coen Brothers loved the film but afterwards asked “Who is the actor, the one with the moustache, we didn’t recognise him?” They thought I was a non-professional actor. It’s the best compliment I could have received. Long takes are a marathon, not a sprint and if Measure had been heavily cut it would have taken away from the real. MA: Most of the cast are non-professionals: what was the biggest difference for you in working with them and did they seek your advice during filming? VL: For me it was a film like any other. There’s a story, a camera and characters. I don’t like to say non-professional actors; I’d rather say actors who are acting for the first time. I often work with so-called professionals who are anything but. I worked with the cast of Measure the same as I would with any other actors. We’re simply in a scene together and we try, as best we can, to bring it to life. However, they very seldom asked for my advice. I had the advantage of knowing the acting profession much better than them but they had one up on me because often they were playing their own roles. That was an area where they were stronger than me. In the first scene – where I am at the job centre – the guy who’s behind his computer was in his real-life office. What he had to do was recreate what he does for a living for the cinema, whereas I had to invent everything. MA: Your son in the film, Mathieu (Mathieu Schaller), is mentally handicapped. The fact that he, like everyone else, is put under such pressure suggests that no-one escapes bureaucratic injustice. VL: There is pressure everywhere in the world today. Stephane’s aim is to the show that at any layer of society – be it rich people, poor people, handicapped people – there is a hierarchy, suffering, the haves and have nots. MA: When working at the supermarket it seems that Thierry sympathises with the actions of his colleagues and those who steal from the shop: is there an internal conflict for him there? VL: There comes a time when everyone is asked to make a choice: maintain your dignity and pride or go against your moral compass. Either you stay in your job, you don’t put your wife and son in peril, you’re paid at the end of each month but your ethics and sense of pride are lost. It’s a choice you have to make. Thierry makes this choice. There are people who stand up and speak out and others who stay seated. Thierry is the same man whether he has a job or not. He is a dignified, straight-up guy, who has suffered with not working for years. He finds this job but there’s a cost. He prefers a return to unemployment than being complicit, collaborating with what he sees at his workplace.